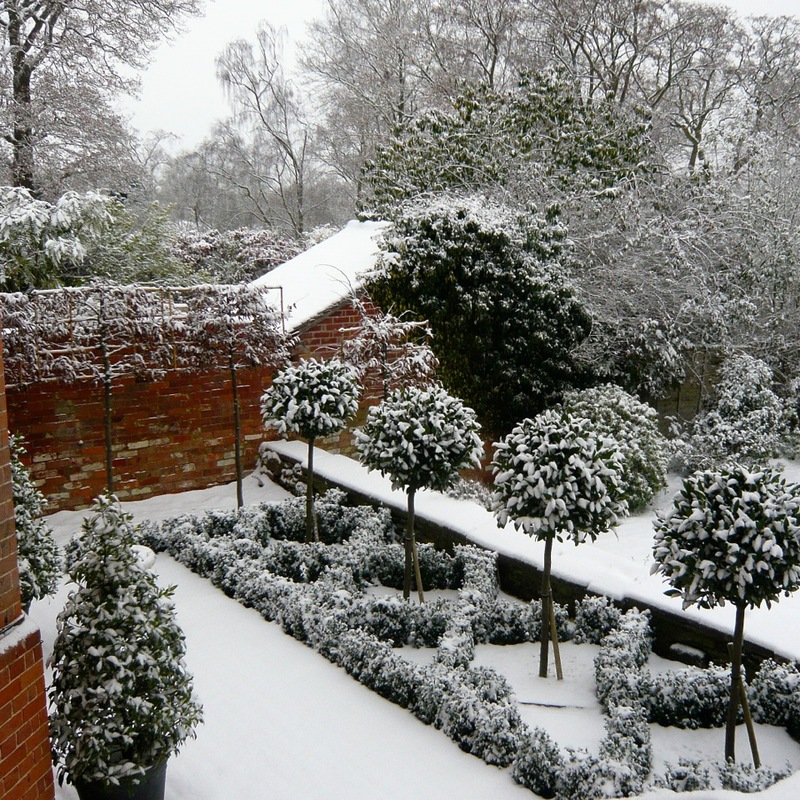 The story of our Knot garden starts in June 2010. 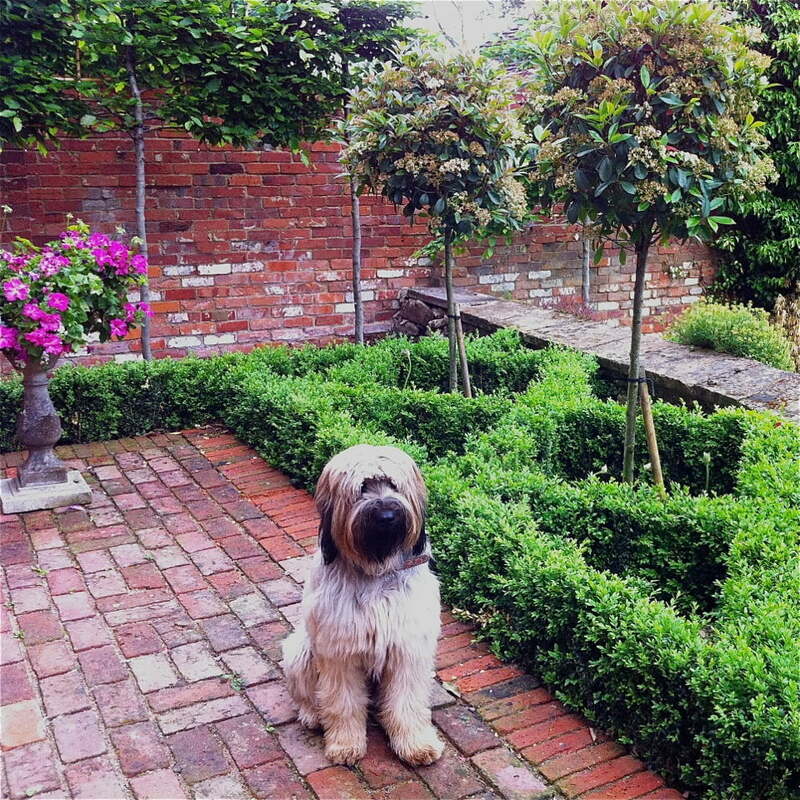 We had a really grotty small courtyard beside the house full of ground elder. 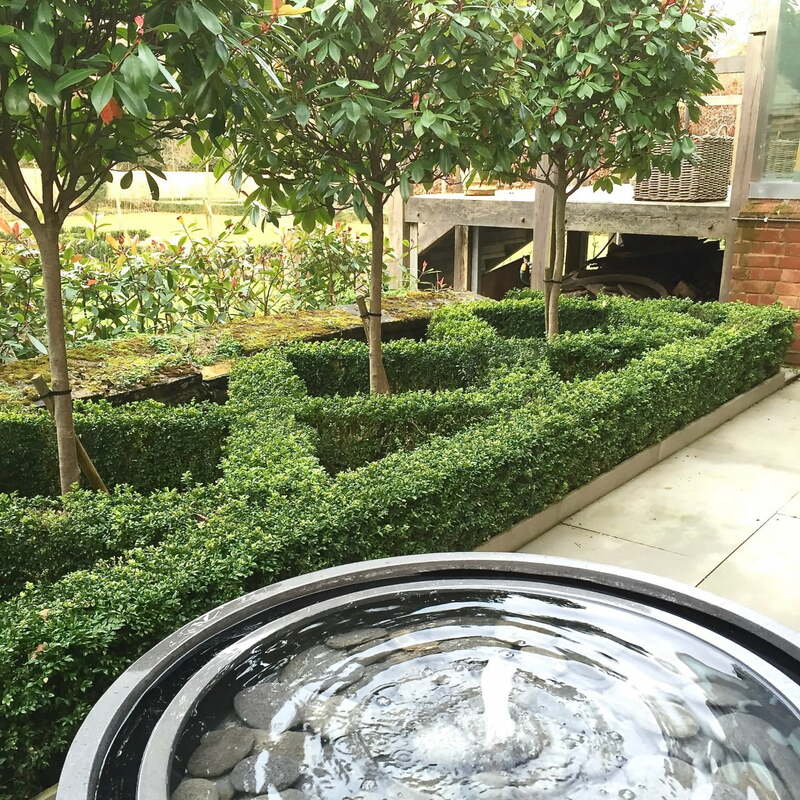 I’ve done loads of knot gardens for my clients but have never had one myself… Here was my chance! I absolutely love knot gardens & the possibilities are endless. 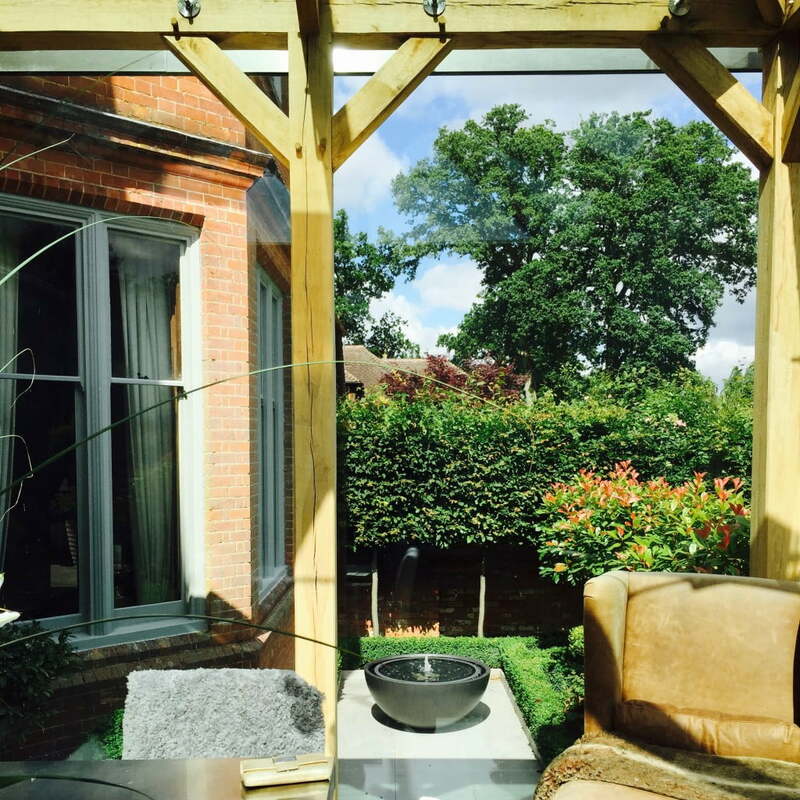 They suit all styles too – contemporary & classical. 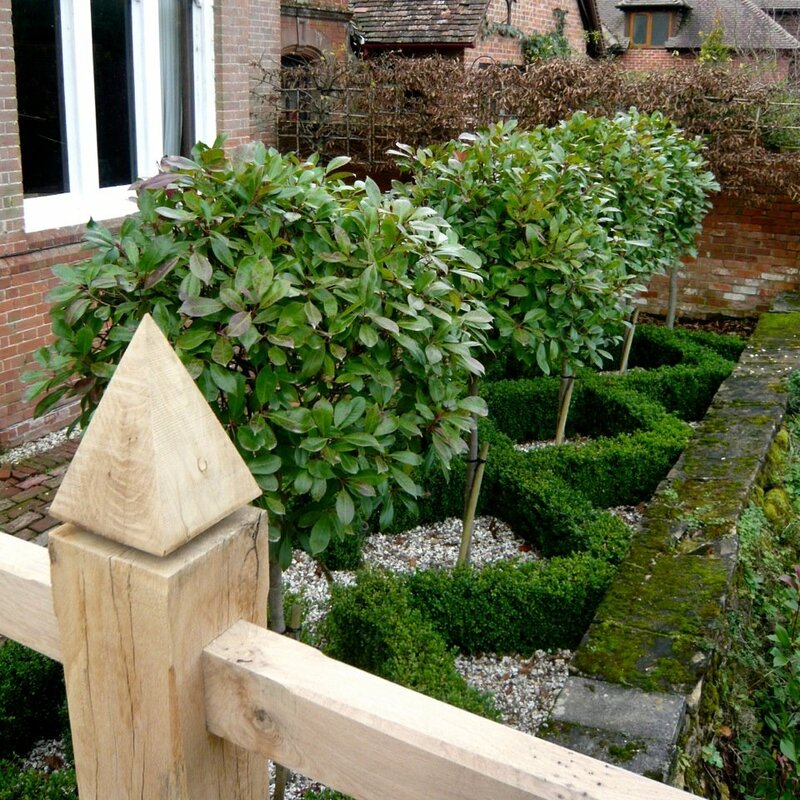 Knot gardens were first created in Medieval times & they were known as Embroidery for the earth – how fab is that? 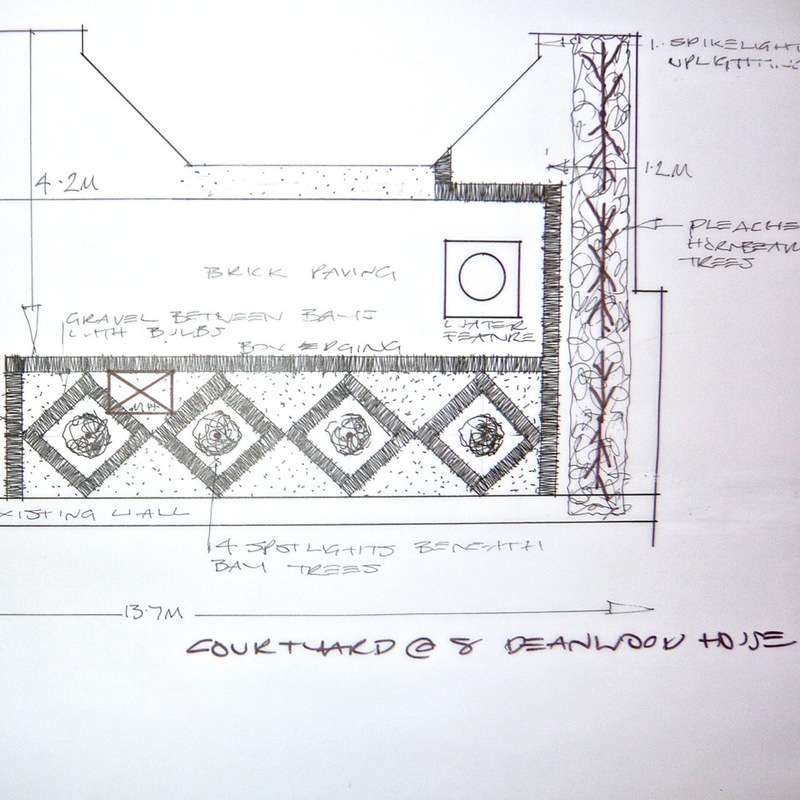 My initial sketch – it’s very simple as the area is small & I didn’t want it to look too fussy. Here it was the week before we moved in. I liked the old bricks but everything else had been neglected for years so was a complete mess. I wanted to create a bit more privacy from the cottage next door too as the wall wasn’t quite tall enough. 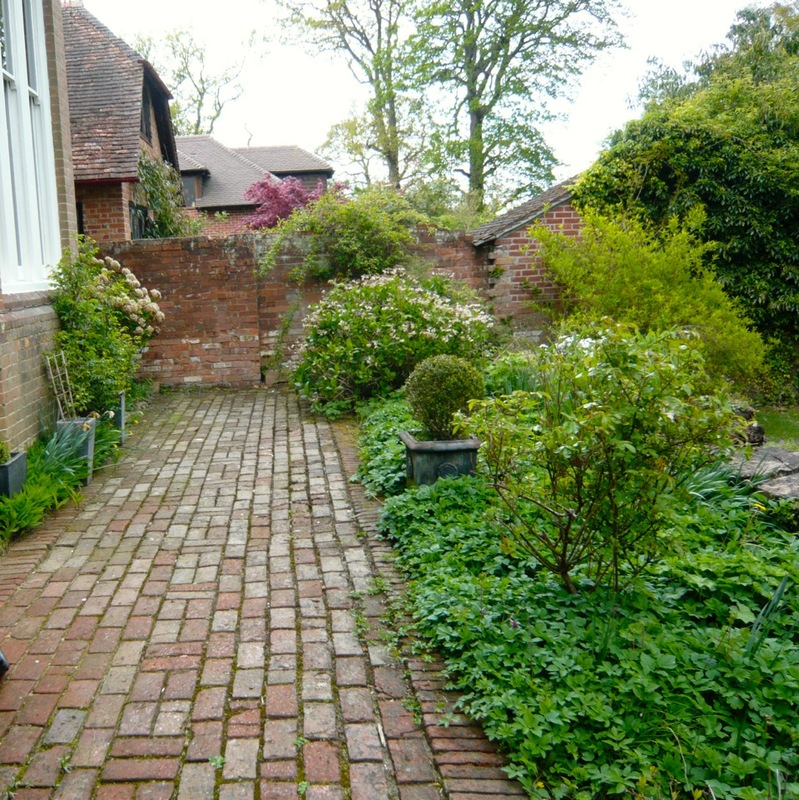 The bricks have been relaid. I used bay trees for the centres of each diamond with a weed proof membrane & local gravel on top for contrast & to keep weeds well away. 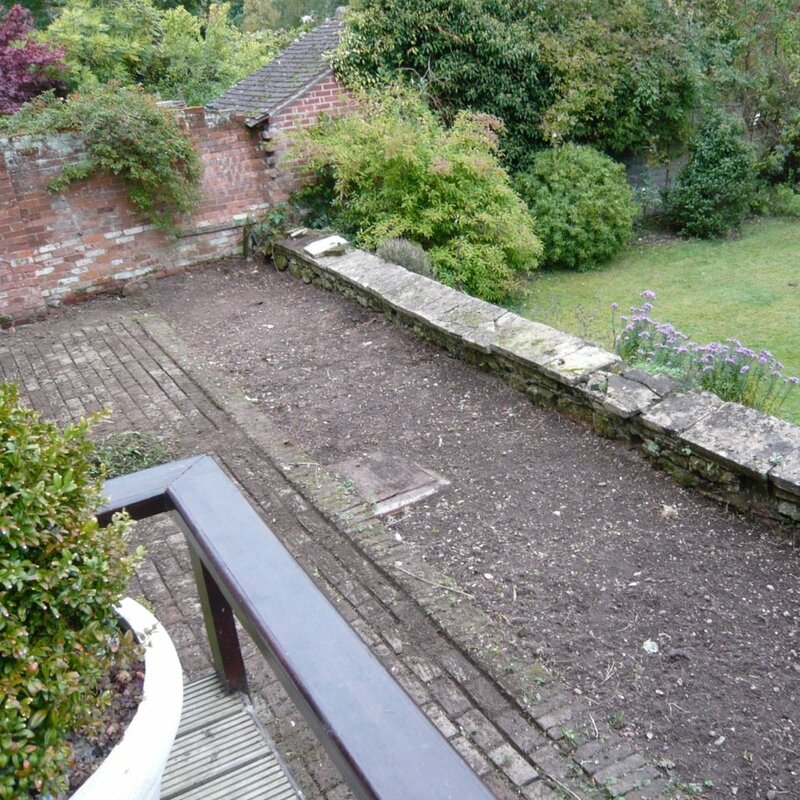 We’re north facing so no alliums or lavender. 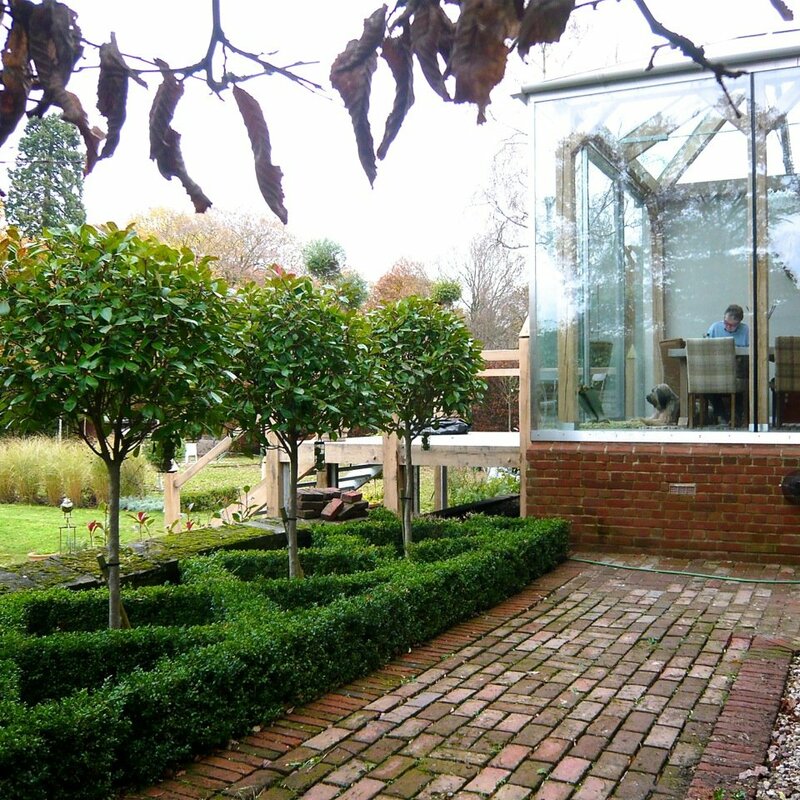 Ready pleached stilted hornbeams in pots waiting to go in against the wall & screen us from the neighbour. We’ve kept the old retaining wall on the right, I’m not keen on it if I’m honest but it’s way too expensive to replace. Wasn’t it pretty in the winter? Big mistake! 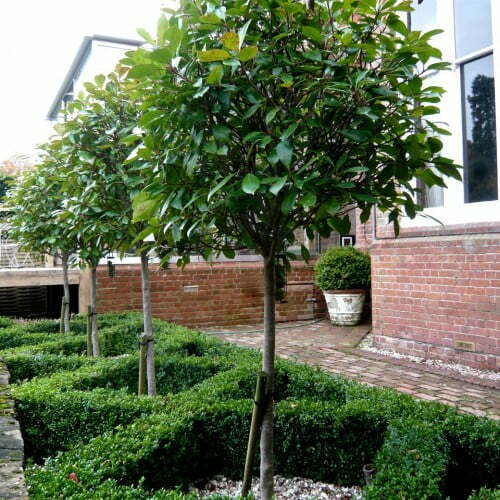 I didn’t protect the bay trees & we lost the lot as they were imported from Italy & simply weren’t acclimatised. The gap in the knot shape if you’ve spotted it is where we unearthed a manhole cover – very frustrating! I replaced with photinia which were grown in the UK & are tough as old boots. Both the box & my dog were due a clip when this was taken! 3 years on and we’ve tweaked it again. 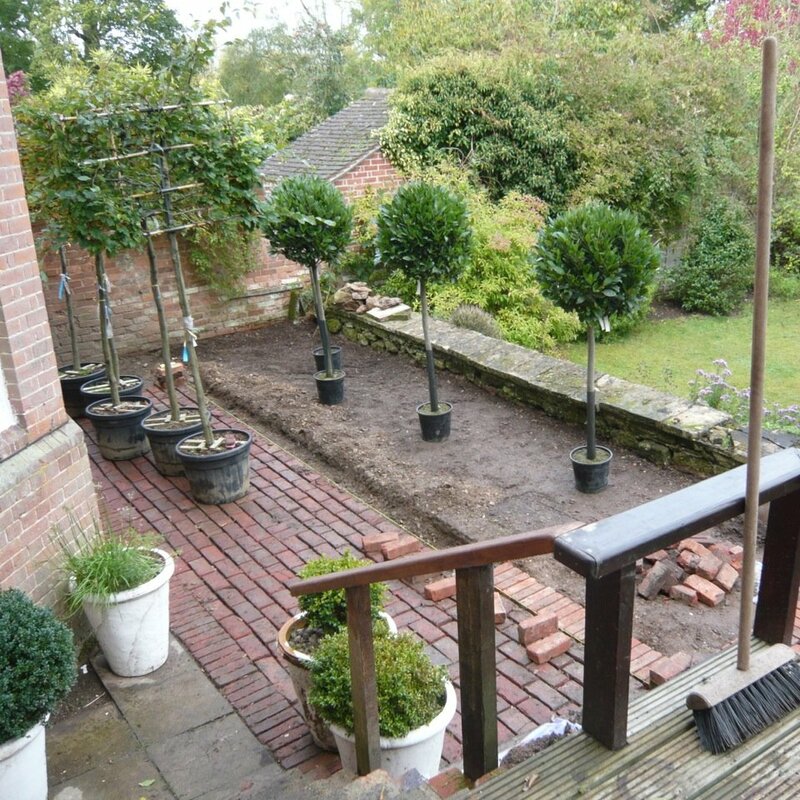 The brick floor got really difficult to keep weed free so we changed it to a grey stone to match that we have in our extension. 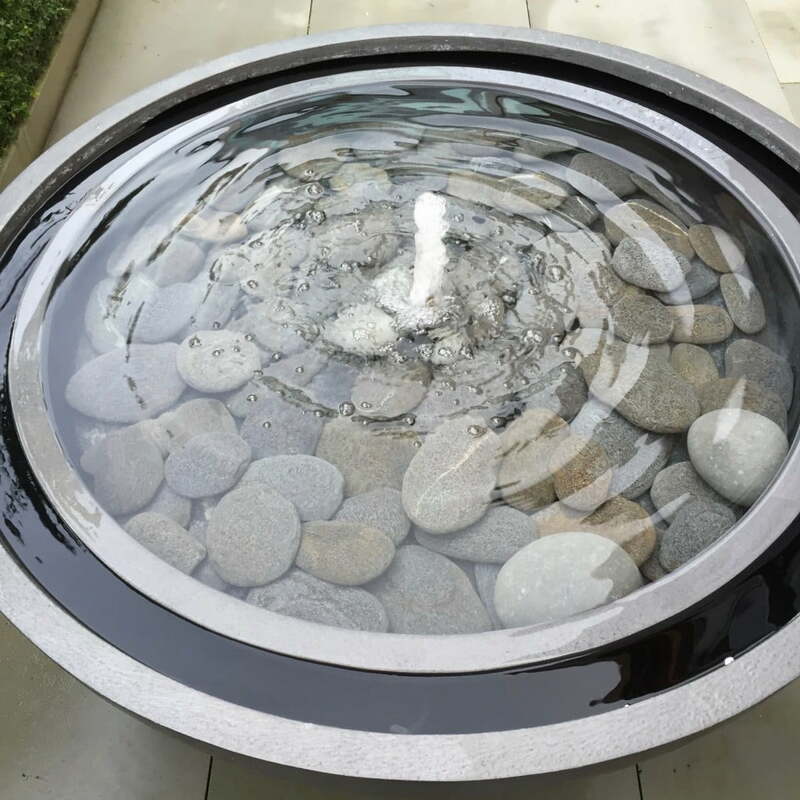 We also installed a lovely water feature by Capital Garden Products that looks just perfect – we are delighted!